Rectangular pie dish. 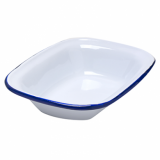 The classic retro blue and white enamel 18cm pie dish. 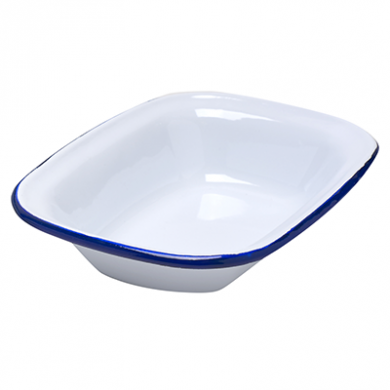 Add character to your table setting with range of blue and white enamel tableware. Crafted from heavy duty stainless steel, this pie dish is coated with an ultra durable, fused-glass coating, giving it a tough, smooth finish. Unlike normal plates it is designed to take on a bump or two, the chips and imperfections add to its retro look! Dimensions 50(H) x 180(W) x 130(D)mm.